Hybrid wick fire poi are one of the very first tools we introduced to the fire world. To be fair, we didn’t really invent the thing. 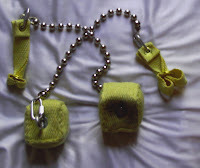 Even the Seattle fire codes as late as 1990 indicated that cotton wicks should be covered with kevlar. Doubtlessly, news of this trickled down to LA to influence the design. However, the specific construction methods were pretty much new. First, instead of wrapping a denim cathedral stack in kevlar to keep the cotton embers from flying willy-nilly, we started with a sealed cube of kevlar, then filled it with cotton. Plus the cotton used isn’t a woven variety so these wicks are super absorbent. This makes them perfect for spinning alcohol based fuels. Unlike pure kevlar, alcohol burns beautifully on these wicks, even the colored fuel variants. Unfortunately, cotton has a weakness for heavily oils, so kerosene and lamp oil are contraindicated. It seems that the extra time burning these oils will cause the cellulose to break down and start a low oxygen burn, kinda like charcoal when it’s just red and glowing. This makes them less than ideal for beginners and travelers, who might not have as many choices in fuel. The kevlar grips are another thing we introduced at the request of many teachers. Most people used leather when these were introduced. Now leather has two real problems. First, they have a break-in period before they become comfortable, then, they stay exactly that way until they break. So, no real indication that they’re about to fail. Next, they’re usually quite stiff. In fact the better they’re made the more stiff they are. This stiffness reduces a lot of the pull from the wicks. Reduced pull means that you have to spin faster to feel where the wick is. Faster spinning makes it harder to hit the timing on new moves, and sharpens the learning curve. So, with kevlar, both problems are solved. The lighter, yet stronger, material transfers most of the weight to the wearer, so they can spin slower and still feel where the wick is. And kevlar gives a long, slow clear indication that failure is imminent. The strands stretch, they may even fray a bit, and generally they look like ratty jeans. This allows even the most inexperienced spinner know that it’s time to replace the wicks. The rest of the hardware is all steel, rated at 150 pounds or more. The parts are selected for their modularity, the chain is all spinners, so no kinking. Also the nice round ball chain is generally preferred for comfort among those who do chain wraps on the skin.